The Bottle: It may come in a Bordeaux bottle, but this white wine is all Italian. Made from Trebbiano and Grechetto grapes, this Umbrian mainstay is named for the Village where it was made. The abv is 12%. I seem to remember it was a real steal, right around $5. The Nose: Orvieto has a warmer climate in central Italy and chalky, limestone-laden soil that imparts a serious terroir to the wine. If you are a fan of dry whites that have minerals to spare, an Orvieto may be a good choice for you. I get a nose full of minerality when I smell it, along with a hint of citrus. By the way, coloring is very pale and there are a few bubbles clinging to the glass. The Taste: Very earthy and tangy, this Orvieto is a basic, no-frills Italian white wine. Dry as a bone and quite refreshingly crisp, it's a wine that begs for food. Let me correct that. It's a wine that begs for scallops in a butter sauce. It's a wine that begs for shrimp scampi. It's a wine that begs for crab cakes. Sure, you could sip it on the porch and it would serve you very well. But look around you. Is the grill nearby? Fire it up and throw some skewered shrimp on there. The Orvieto will thank you. The Bottle: Wow, that's quite a moniker. I'll just think of it as "Alicante" from here on out. The back label - the front was all taken up with the name - describes the Alicante Bouschet varietal as a grenache hybrid, created in France in the 1800s. It became popular in America during Prohibition, due to the intense coloring, which allowed much dilution. This wine is made from the fruit of 85-year-old vines in Lodi. The label promises tastes of red currants, cherries, leather and spice. 13.5% alcohol. The Nose: The Alicante has a vibrant and fruity nose, with a strong whiff of clove or allspice and a dark edge that's hard to pin down. Pretty yummy aromas. Very rich in color, too, as the grape promised. The Taste: It's a medium bodied wine that immediately gives up currants and black cherry. There is an earthy, almost funky quality that underlies all that fruit. It's very interesting, if not altogether satisfying. It certainly didn't stop me from enjoying every last drop in the bottle. I would think this would be a nice match with something like stuffed mushrooms, lamb sausage or a dark chocolate morsel. I understand that Coppola made a limited supply of this wine, most of which ended up at Cost Plus World Market. That's where I picked it up a while back. It ran about $15. The Bottle: A classic green Burgundy bottle sports a stylishly black label with a single yellow flower above the name "Summerland". This hamlet just east of Santa Barbara and west of Carpenteria serves not only as a beautiful little stop along the 101 Freeway, but also as a home to a winery that produces some outstanding wines. Listed on the bottle as Santa Barbara County, the 2007 Pinot Noir clocks in at 14.1% abv. The blurb on the back label explains that the wine is tasty, nice smelling and aged in French oak barrels. Okay, I'm game. It retails for $24. The Nose: A big cherry explosion occurs when you sniff this wine, a suitable companion to the medium see-through ruby color in the glass. The oak is quite evident, with notes of some gutsy spices and a cedar-like quality. The Taste: Silky smooth and a middleweight on the tongue, this wine has an unusual fragrant taste, rather like strawberries on your cereal. The cherries are still there, too. It's not overly tannic, but definitely has guts. I'd love to try it with a pork dish or a mild cheese. The Bottle: This Tuscan winery sources grapes from the Umbrian city of Orvieto. A $10 wine, it's composed of 50% Procanico, 30% Grechetto, 10% Verdello and 10% Canaiolo Bianco. The Nose: A pale yellow-green tint barely colors the wine. The nose is floral and fruity, with pear and apple most noticeable. 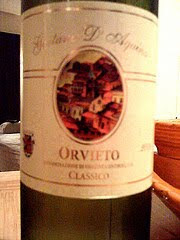 The Taste: In the mouth, this Orvieto is delicious and well-structured, a very drinkable wine. A clean minerality is present. The finish is great. It's a really nice sipping wine, but it's even better with food. It paired nicely with my sea scallops from the grill, and the lettuce, tomato and shaved parmesan salad. The place where this wine really earns its keep is with cheese. Had it with a bleu, Parmesan and baby Swiss, and it brought out the best in each of the cheeses. I just wanted to put a quick note in this space about a really nice wine I had last night. Livernano L'Anima Bianco is a wonderful Tuscan white wine. 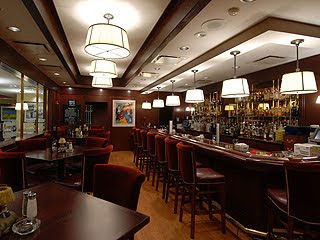 I had it in the bar at Morton's, Beverly Hills. It was a featured wine on their bar menu in the by-the-glass section. This wine is a blend of Chardonnay, Sauvignon Blanc and Gewurztraminer. I'm a sucker for an interesting blend, and this really grabbed me. The nose was very floral, as was agreed upon by everyone in our party. I picked up what I interpreted as a petrol aroma, for which I was roundly criticized. Perhaps it was a grassiness that came through from the S. Blanc which I interpreted incorrectly. Crisp and clean on the palate, there was a zestiness I really loved. The acidity was perfect for food - crabmeat salad, maybe - and it finished well, too. I conducted a cursory web search and didn't find it for sale, but I'll keep looking. In the meantime, it's worth a trip to Arnie Morton's bar to have a glass. The Bottle: A slim Burgundy bottle belies the wine inside. 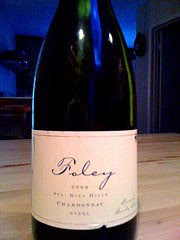 No big, fat, overblown Chardonnay bottle here. This lean, unoaked wine gets a container that's lean, too. 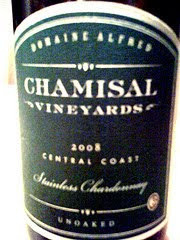 Chamisal Vineyards - formerly Domaine Alfred - is in California's Central Coast appellation, near San Luis Obispo and Edna Valley, home to some very fine white wines. The abv on the label states 14.1%. I'm ready for the pure taste of Chardonnay. The Nose: Pure fruit, no oak at all. This is a really beautiful smelling wine. Apples seem to dominate for me, but there's a tropical or citrus angle at play, too. The aromas are quite vibrant, giving me the impression the taste will be amazingly fruity. The Taste: Apples, then peaches, then a zippy, zesty flavor on the finish give my taste buds an E-ticket ride. The acidity is quite nice; not overwhelming, but definitely able to handle some swordfish or cod. The finish is rather lengthy, and the clean, crisp minerals linger after the fruit has finally faded. I really should have written about this event already. It's two weeks after the fact, and I want to go to it again. My friend Nicolas Soufflet - pictured at right - staged this little taster in Hollywood, and did a fine job with it. When he does another one - and I know he will - you should attend. A Taste of Tuscany was held at Victor's Square Restaurant, on Bronson north of Franklin in Hollywood. It was a very nice setup, with the restaurant pretty much devoted to our crowd. Three tables were arranged like a square with a side missing. This gave Nicolas a stage of sorts from which to work. A stand-up map of Tuscany loomed large, so we could all have a visual reference of where the wines were produced. Much of the space was filled with cases of the wines we were to taste. Nicolas stood in front of the map and explained in detail the specifics of the wines we were tasting. His knowledge and personality provided at least as much enjoyment as the wines. And that's saying a lot. Vernaccia di San Gimignano - Tuscan white, 100% Vernaccia. A pale golden color, very light nose. Dry and refreshing with minerals, citrus, good acidity. Hint of wet rocks, strong minerality. Trebbiano Toscano Bianco - Another white, from the Barco Reale region of Tuscany. Trebbiano is the white counterpart to Sangiovese. 85% Trebbiano, 15% Malvasia. Pale color and pungent nose, very clean taste with a good finish. Smokey flavor, very smooth. Great with Parmesan cheese. Morellino di Scansano - 100% Sangiovese. 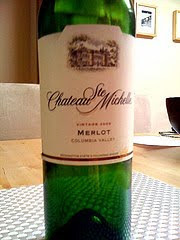 Medium purple, dark fruit nose, great flavor of blackberry, plum, black cherry. A nice finish, very clean with a kiss of oak. Morello Toscano Rosso - 75% Sangiovese, 25% Cabernet Sauvignon. Darker ruby color, oakier nose. Aromas of black cherry. Medium mouthfeel, dark fruit, currant, some vanilla. Good acidity; needs a steak! A bit lightweight for me, but a nice taste saves the day. Chianti Riserva - 100% Sangiovese. Quite dark ruby color. Oak very predominant on nose. Medium mouthfeel. A little oaky, showing a bit of spice, plums, some raspberry. Again a lightweight feel. Rosso di Montalcino - 100% Sangiovese. Deep red with a nose full of roses and oak. Tannic & fruity - plums. Very good for food, with great acidity. This wine is very easy to drink. Vin Santo del Chianti - 70% Trebbiano, 30% Malvasia. Very good dessert wine, salmon in color with some tawny looking shades. Could be the light. A sweet nose and a sweet, nutty palate. VERY good with biscotti. My wife is a big fan of barley candy, and she said this wine had very strong notes of that treat from her childhood. A Taste of Tuscany was held at Victors Square Restaurant, on Bronson north of Franklin in Hollywood. It was a very nice setup, with the restaurant pretty much devoted to our crowd. Three tables were arranged like a square with a side missing. This gave Nicolas a stage of sorts from which to work. A stand-up map of Tuscany loomed large, so we could all have a visual reference of where the wines were produced. 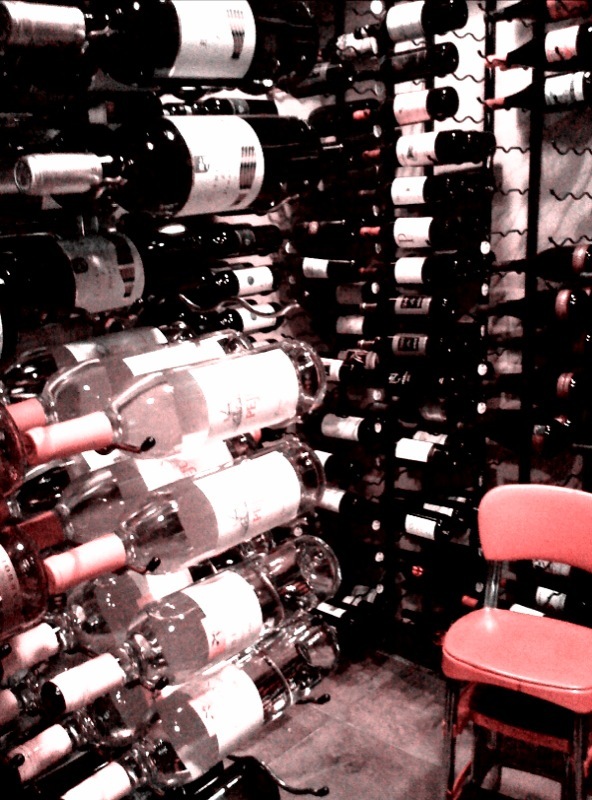 Much of the space was filled with cases of the wines we were to taste. 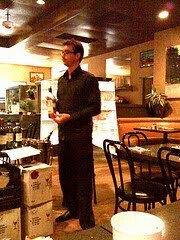 Nicolas stood in front of the map and explained in detail the specifics of the wines we were tasting. His knowledge and personality provided at least as much enjoyment as the wines. And that's saying a lot. 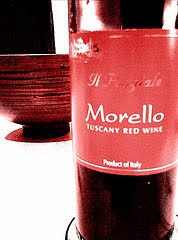 The Bottle: Morello's label is a wine-red plate upon which a golden image of a Tuscan winery is laid. It's plain, but beautiful. The wine is from Toscana, a 75/25 blend of Sangiovese and Cabernet Sauvignon. An abv of 13.5% holds no real surprise. The fact that it's non-vintage does, a bit. In Barco Reale, where the wine is produced, the farmers call the Sangiovese grape "Morello," hence the name. Morello also is said to be the chestnut color of a certain horse. The Nose: I get an almost sweet-smelling black cherry note that dominates the nose. it's a powerful aroma, and one that I like quite a bit. Nine months in oak leaves its mark, but it doesn't overshadow the fruit. It doesn't strike me as a very complex nose, but it's a pleasure to smell. The Taste: It's a fruity wine, with currants and cherries in the forefront. The medium body is complemented by a nice lengthy finish. A lack of complexity probably goes hand-in-hand with the NV designation, but I'm not complaining about it. It's a good drink. Very dark and full of wood and leather, The Wine Cellar at the Rio on Tropicana in Las Vegas is cool in temperature - natch - and the jazz is pretty cool, too. Easy bebop from the likes of Miles and Charlie Parker really set the mood for a good wine tasting experience. There are two dozen flights on the menu at $12-$79. Yes, $79. That does sound like a lot, doesn't it? Each flight offers two-or-three ounce tastes, three to a flight. I had the Riesling flight, "Sweet and Smooth." Here are my tasting notes. 1. Gunderloch Jean-Baptiste 2007 Kabinett - Sweet nose like honeysuckle. Tastes like peaches, melons. 2. Monchhof Robert Eymael 2006. Urzig Wurtzgarten, Spatlese - Smokey nose, like something on fire. No, like lake water smells near an outboard motor! Taste seems quite grassy and the sweetness has to struggle out. Very peculiar taste. But I like it. 3. Fritz Haag 2003. Mosel-Saar-Ruwer - Similar funky grassiness on nose. Reminds me of cutting grass - the exhaust from the lawn mower. Taste not sweet at all. Rather flat and burnt. Not very appealing to my palate, I'm afraid, but sort of interesting. Lacking acidity. This was one of the more interesting tasting sessions I've had, and one of the most enlightening. If you are tired of the casino floor, simply walk down the stairs into The Wine Cellar. The hustle bustle of the gambling is behind you as soon as you go below ground level. 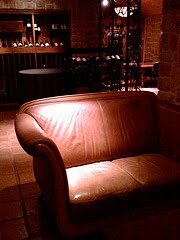 I highly recommend The Wine Cellar to all wine lovers who find themselves in Las Vegas, looking for a respite. Very dark and full of wood and leather, the Wine Cellar at the Rio on Tropicana in Las Vegas is cool in temperature - natch - and the jazz is pretty cool, too. Easy bebop from the likes of Miles and Charlie Parker really set the mood for a good wine tasting experience. There are two dozen flights on the menu at $12-$79. Yes, $79. That does sound like a lot, doesn't it. Each flight offers two-or-three ounce tastes, three to a flight. I had the Riesling flight, "Sweet and Smooth." Here are my tasting notes. 2. Monchhof Robert Eymael. 2006. Urzig Wurtzgarten, Spatlese - Smokey nose, like something on fire. No, like lake water smells near an outboard motor! Taste seems quite grassy and the sweetness has to struggle out. Very peculiar taste. But I like it. 3. Fritz Haag 2003. Mosel-Saar-Ruwer - Similar funky grassiness on nose. Reminds me of cutting grass - the exhaust from the lawn mower. Taste not sweet at all. Rather flat and burnt. Not very appealing to my palate, I'm afraid, bt sort of interesting. Lacking acidity. Just a quick note from the road about this cool Las Vegas hangout. 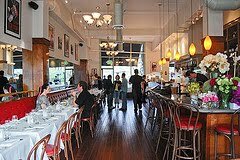 In a mall at Charleston and Rampart, between Banana Republic and Ann Taylor, Nora's is an Italo-centric wine bar with a list that features lots of California wine as well a few offerings from other worldly locales. The main wall inside sports a five-panel mural of a vineyard. Follow along to the right and your eyes go to the wine cellar (pictured). The kitchen area is framed by huge loaves of bread and the tables are clothed in white linen. I could have gone with some tastes from Nora's Enomatic taste system. Three-ounce tastes ran the gamut from just under $5 to just under $50. Yes, $50 tastes! Instead I ordered a glass of Nuschese Falanghina, a great white for a hot August day. This wine had strong orange elements, like an orange liqueur on the nose and orange zest on the palate. Nice acidity and a wonderful finish complete the scene. The food service starts with a plate of olive oil and a trio of salts - regular, pink and a smoked salt that was awesome. The grape tomato pizza was fantastic. Cool, jazzy funk was piped in and fit the mood quite nicely. Nora's is a great addition to the wine scene in Las Vegas. I look forward to a return visit. I could have gone with some tastes from Nira's Enomatic taste system. Three-ounce tastes ran the gamut from just under $5 to just under $50. Yes, $50 tastes! The Bottle: The label promises the splendor of the Chardonnay grape will be showcased by the use of just one little word - steel. It's not that I have anything in particular against the use of oak in the production of wine - far from it. It's just that an oakless Chardonnay is something that should be enjoyed from time to time to give the grape a chance to really shine. A classic green Burgundy bottle contains the pure Chardonnay within it. The abv is 14.3%. This Santa Rita Hills wine is very pale when poured. 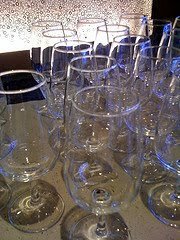 The Nose: The smell of minerals leaps out of the glass first. Then some pears chime in. It's full of the smells of a wet driveway, or a rocky shoreline. The Taste: Very nice, refreshing mouthfeel. Crisp and citrusy with the expected minerality on full display. Lime zest highlights a very nice flavor profile for a summer day and lends itself to what is an excellent level of acidity. 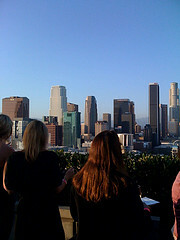 My wife and I had the opportunity to attend a tasting event in downtown Los Angeles recently. Our hosts were the members of the group Los Angeles Wine Tasting, fronted by Jean-Baptiste. On a Friday night in early August, we drove east until we were among the skyscrapers. This group hosts events in a residential high-rise on Grand Avenue called Evo South. From the subterranean parking garage to the rooftop lounge where the event was held, the building has that brand-new smell and look still on it. The garage, in fact, appeared to be rather unfinished. No problem. We didn't stay in the garage too long. Up to the rooftop we went, to a swanky penthouse with an outdoor balcony which overlooks downtown L.A. The view was really astounding, and being able to step outside from time to time lent a bit of variety to the evening. The glass sliding doors which separated the lounge from the balcony were open, so the room had an outdoorsy feel. First, we got a pour of Terree des Papes, Cotes du Rhone, 2007. Obviously this was a French blend of Viognier, Grenache Blanc and Clairette, earthy and crisp with good minerality and a nice finish. Along with it we were given a Swiss cheese, Appenzeller. This cow's milk cheese was quite nutty and mild. I had mine with olive bread. Next up was the Demoiselles Coiffees, Cotes du Ventoux, 2008. This Provence rose was a dry blend of Grenache, Carignan and Cinsault. I picked up lots of strawberry on the nose and palate. The acidity was quite good and as such, it paired very well with the gorgonzola Dolcelatte. Made from cow's milk in Italy, the cheese was strong and hearty with walnut bread. We had actually had this cheese before at home, so we were happy to see it on the menu. It's a favorite. We left Europe for the third tasting. Next stop Chile. Montgras from the Colchagua Valley, 2008. This Carmenere was extremely oaky, but quite interesting. The blackberry flavors went well with a Manchego cheese. The Bermuda Triangle cheese from Arcata, California was a little late in getting to the table, so we helped ourselves to some other cheesy treats on a coffee table. As you might expect, when the Bermuda Triangle came out it was a triangular shaped goat cheese with a really nice and funky taste. The fourth destination was also in South America. Monte de Luz 2007 from Uruguay was our final wine. This bold red was my first taste of the Tannat grape. Since tannins are suggested in the varietal's name, it wasn't too surprising to find that it's extremely tannic. Originating from the Basque region in southwest France, it still thrives there. It's a very strong wine both on the nose and palate, but there was substantial fruit to go along with the tannins. It was a good match for the Spanish Manchego Viejo. Made from sheep's milk, Machego Viejo has a nutty quality but is quite subdued. It let the wine take center stage, that's for sure. As the title of the event promised, there were some chocolates for dessert. Valrhona Grand Cru de Terroir, dark chocolates from 'Nyangbo, Ghana Africa sported 68% cocoa while the Alpaco of Ecuador was 66% cocoa. The wines and chocolates were selected by L.A. Wine Tasting. The cheeses were selected by Laurent Bonjour. You may have seen him and his cheese truck at the West Hollywood Farmers' Market, among others. He's an excellent cheese man. The bread was provided by La Maison du Pain. 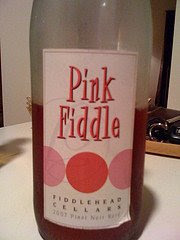 The Bottle: The clear glass bottle leaves no doubt that this Fiddlehead Cellars wine is a rose that looks like a Spanish rosado, more on the red end of the spectrum than the pink. The Pinot Noir grapes are from the Santa Rita Hills in lovely Santa Barbara County. If you don't recognize the Lompoc locale, that's probably because it is well off the beaten path, but very much worth checking out. The abv is 14.4%, a tad high for even a dry rose. It's got a screw cap, if that sort of thing bothers you. It doesn't bother me. The Nose: Strawberries and watermelon abound in this rich nose that screams "Summertime!" The aromas remind me a bit of a backyard swimming pool, in a very good way. Maybe it's the mental connection to the pools of my youth and the summery treats that seemed to go along with them. The Taste: This is a robust rose! It's a real mouthful, with vibrant flavors - almost artificial, like candy - of the aforementioned strawberry and melon, but with a little touch of cran-raspberry thrown in. It's a great wine to take out on the patio on a hot summer day, but it could hold it's own on the dinner table. I think a pasta with an Alfredo sauce would go nicely with it, or maybe some grilled calamari.